In considering whether to move to Toronto, its reputation for stellar jazz performances wasn’t high on my agenda. Sorry jazzophiles, but I associate your scene purely with lifts, hotel lobbies and people who use the word “funky” in everyday parlance. But that was before I’d experienced the Beaches International Jazz Festival, which sadly finished on Sunday. I seriously feared my ears would be assaulted with this kind of thing (with apologies to the “charming and talented person” who posted it on YouTube) – or even travesties on this scale. The latter goes to prove that anything that could potentially be suffixed with “lite” is to be avoided; that includes beer and, most definitely, Beethoven. 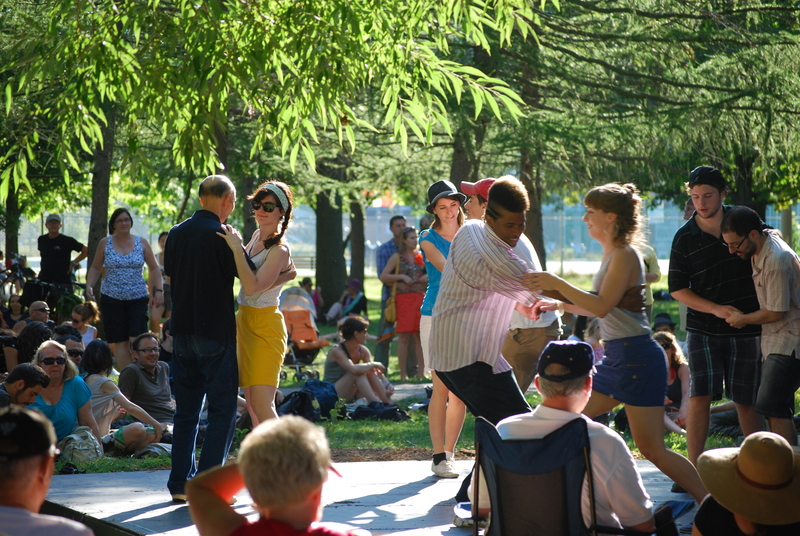 Happily, the Beaches Jazz Festival was very flexible in its definition of “jazz”, which seemed to incorporate anything from big band to soul, rock, beardy blues, latin, gospel, hip-hop and reggae. The festival takes place over a few weeks, with events held at different stages across the neighbourhood. But on Saturday evening a 2km stretch of Queen Street East was closed off to traffic and tons of performers and groups set up on the street, sparking some spontaneous dancing and LOTS of Peter Kay- style “walking to the dance floor” moves (guilty as charged). My favourite group – despite the name – was God Made Me Funky, a brilliant frat party style band that performed mash-ups of Nirvana, Cypress Hill and LMFAO. Here’s a video of them on the night – slightly poor sound quality, but you get a sense of the atmosphere. A great night, enriched – quite literally – by a very reasonable prix fixe menu dinner at nearby Velouté. Getting Outdoors and Loving It!